Listen, do you hear that? I know. There's complete silence in my house right now! You'll have to pardon my giddiness. I'm just a little excited that I got to enjoy literally my first ever day off from work without the kids. Don't get me wrong. I love having my kids home with me all the time, but today was much needed and just plain wonderful. Even if all I did was clean. I feel refreshed and I love having the house back in order. But let's talk about these cookies now. It's officially apple season and I love taking advantage of it. I've got my favorite go-to recipes that we make each year, especially stocking the freezer with this easy, homemade applesauce. My favorite part though, is trying out new recipes. It's just fun to experiment and many times we find new family favorites. I think we can consider this cookie a new favorite as well. The cookie itself is very soft and has a cake-like texture. The frosting is so easy to mix together and tastes just like caramel. Paired together, it's a real winner in my book. I can't wait for you to try these out and let me know what you think! Do you have a favorite apple recipe you make year after year? Share your comments below. In a large bowl, cream together butter and brown sugar until light and fluffy. Add in egg and cider, mix together well. Gradually add in all dry ingredients and mix until combined. Lastly, mix in grated apple. Line cookie sheets with parchment paper or silicone baking mats. Drop cookie dough onto prepared sheets using a medium sized cookie scoop. Bake at 350 degrees for 10-12 minutes, cookies should be lightly browned. Remove from oven and let cool for at least 5 minutes before removing from pan. To make frosting: In a small saucepan, melt butter, brown sugar and apple cider together; just until sugar is dissolved. Remove from heat and whisk in powdered sugar until smooth. Frosting will thicken up as it sets, if need to thin just add a tsp of milk or cider/juice to do so. 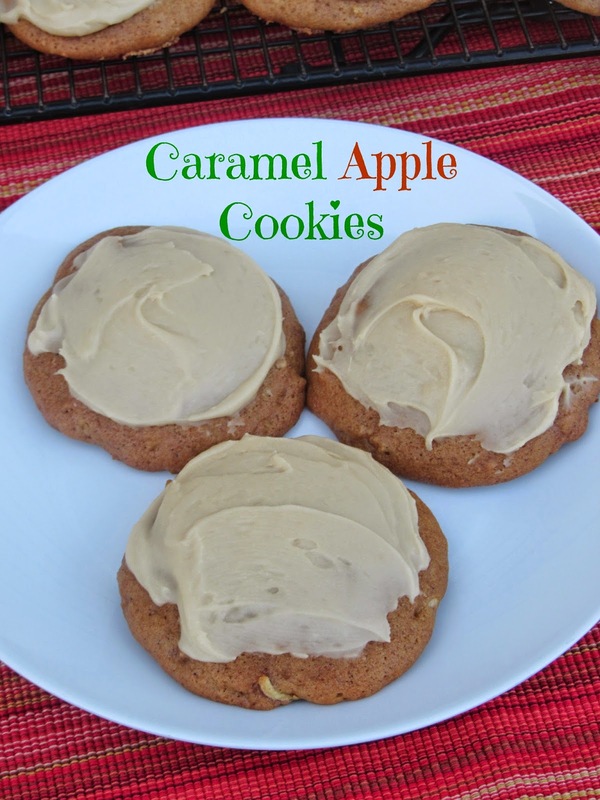 Once cookies have completely cooled, you may frost with the caramel frosting. Store cookies in airtight containers. Makes about 3 dozen.